Bo'ness Speed Hill Climb, June 1950. Homepage. This page: Official programme for the Bo'ness hillclimb meeting, held in June 1950 at the Kinneil Estate. 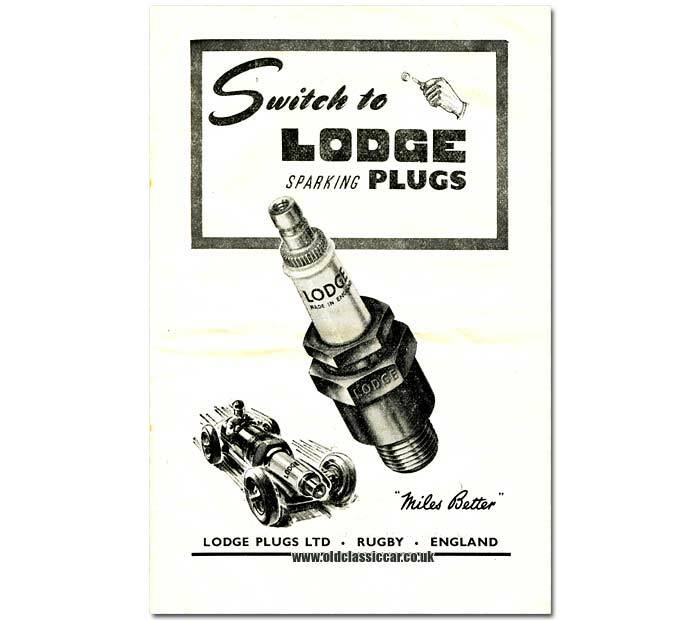 Return to the Motor Racing Programmes page. 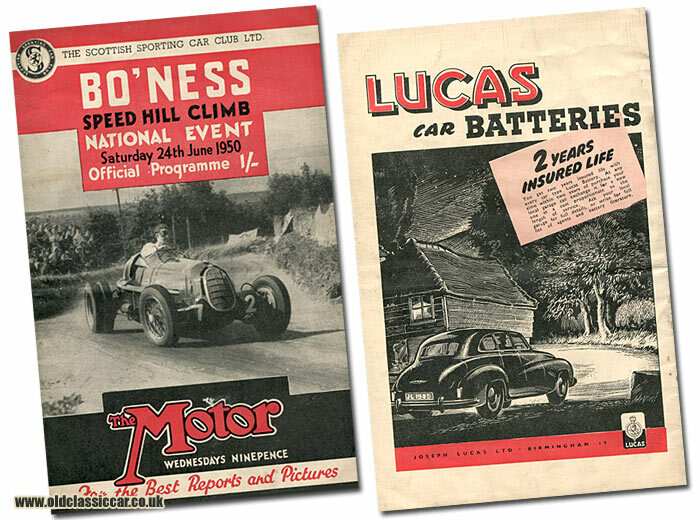 The first speed hillclimb was held at Bo'ness, in the grounds of the Kinneil Estate, in 1934, one year on from initial discussions that took place where the establishment of a full-blown motor racing circuit was discussed. Members of either the Scottish Sporting Car Club (SSCC) or the West Lothian Motor Cycle Club (WLMCC) could take part at this closed event. Local man A.K.B. Clarkson in his V8 Ford road car set the fastest car time of the day, at 36.2 seconds, while the leading motorcycle was a 500cc Sunbeam that completed the ascent in 31 seconds. Meetings continued to take place throughout the 1930s, the final meeting prior to the war occurring in May 1939. With WW2 dispensed with, racing activities at Bo'ness were soon to get back into gear with the first post-war meet being held in May 1946. The programme I have is for the 24th June 1950 event. The cover features Dennis Poore, a regular post-war competitor and for a time holder of the hill record at Bo'ness, manhandling his large Alfa Romeo up the winding course. He was up against other top hillclimb drivers of the era including Ken Wharton, Peter Collins, and Joe Fry. Poore was fastest in his class with a time of 38.47 seconds, but Wharton pipped him to the Fastest Time of Day (FTD) with a time of 38.41 seconds in the smaller, much more nimble Cooper. Presumably the photograph featured on the programme's cover was taken at one of the 1949 meetings. Note the lack of protective headgear, and the painted-on entry number. In 1947, while still getting to grips with his recently-acquired ex-Scuderia Ferrari car, he was unfortunate enough to roll it during a practice run. It was after this I believe that he changed the colour of the car from red to Westminster Green. In 1950, the results from six hillclimb meetings would contribute to deciding the outcome of the RAC British Hillclimb Championship (Poore would win, after being runner-up in 1949). These were Shelsley Walsh, Rest-and-be-Thankful (held one week after Bo'ness, also one of the six), Bouley Bay, Craigantlet, and Prescott. Each competitor would nominate four of these events, the results from which would go towards his final total for the season, therefore careful choices had to be made, bearing in mind any personal preferences, and of course the suitability of their car at each venue. In addition to championship points (where applicable), several awards were also destined to be presented at the June gathering. Fastest Time of the Day £50. Second Fastest Time of the Day £35. FTD by a sports-car entered and driven by a member of a promoting club £5. FTD by a lady member of the promoting club £5. FTD in each sub-division of the classes outlined in Regulation 3 - Tankard. There was also great interest in which of the home-grown, Scottish, drivers would be fastest of their group. David Murray, "Scotland's only Grand Prix driver" (at the time) was a leading contender in his ERA, being already the fastest Scot to have competed at Bo'ness. Mirrlees Chassels would be hot on his heels, as would Joe Potts in a Cooper. For the first time, times would be measured down to the last thousandth of a second. Entries would, as normal for this type of event, be grouped into classes. Class 2(b) was for non-supercharged sports cars of 751cc to 1100cc, and had examples of Singer, Riley, Fiat and Lagonda in its line-up, plus the unusually-named Bongazoo special (939cc) of A.H.B. Craig, who did a run of 53.37 seconds according to the pencilled notes in the programme. Class 2(c) was for supercharged cars of the same capacities as 2(b), with only three cars - a Buckler, the Lund Special II, and a 1087cc MG - entered. Class 3(b) featured non-supercharged sports cars of 1101cc to 1500cc, fifteen of which were due to compete. MGs were the most numerous, joined by a pair of HRGs, a Singer, and the following specials: Ausfod (entered by F.S. Stang), the Hopper special (I. Hopper), and the Harris-Gilbert special (E. Harris-Gilbert). 3(c) was for supercharged cars of 1101cc to 1500cc. A 1495cc Aston Martin was set to trade times with a 1496cc s/c Fraser-Nash (sic), the Stafonak (1172cc - presumably Ford based), and the 1352cc Axis, of P.S. Hughes. Only the Aston didn't set a time in this class, the quickest being the Axis. 4(b) featured non-supercharged cars of 1501cc to 2000cc. A pair of Frazer-Nash BMWs went head-to-head with the H.W. Alta of J.H. Walton, the Jackal (1976cc), the Girastro Rover (1806cc), Omega (1994cc) and a Veritas. 5(b) contained non-supercharged cars in the 2001cc to 3000cc range, with a Jaguar set to battle with various Healeys, a Talbot, SS, Lea-Francis, and a lone Austin A90 of all things. 6(b) was again for non-supercharged motor-cars, in the 3001cc and over range. Jaguars and Allards pre-dominated. Oddballs in the list include the 3917cc Jabas, and the 4000cc Watson. 6(c) for supercharged cars featured just one - the Chassels Special - while class 7 was for vintage cars. Here, examples of Vauxhall, Bentley, Sunbeam and Bugatti brushed off competition from a lone 990cc Fiat. Class Zero was for the real tiddlers, ie those upto 500cc in capacity. Coopers and the MHM of J.C. Moncrieff took part. Now to the racing cars. 1(a) fielded competition-bred cars of 501cc to 750cc. Just two, a Cooper and an MG, were entered. 2(a) saw racing cars of 751cc to 1100cc take to the course, namely the Alexander special, Joe Potts' J.P. special, a 1 litre Cooper, a Ford, Joe Fry's Freikaiserwagen, and Ken Wharton in the Cooper. 3(a) for cars 1101cc - 1500cc had three cars listed, the Fisher special, David Murray in the ERA (instead of a Maserati), and the 1596cc Sprite special. 4(a) had just two cars in it (1501cc - 2000cc), a Lea-Francis, and Ken Hutchison's ERA to be driven by Joe Fry. 5(a) had one lonely entrant for the 2001cc - 3000cc class, a car belonging to G.S. Hendry named The Bee (2230cc). The big bangers were reserved for 6(a), racing cars of 3001cc and over. Here, Poore's 3.8 litre Alfa was up against A.J. Butterworth's A.J.B., although only times for the former's two runs have been recorded in the programme. Various advertisements, in the main for local automobile-related businesses, are dotted throughout the programme. The Granville Chemical Company Ltd as an example list a number of handy products, including the Granville Radiator Superseal, the Superweld (for cracked blocks etc), and the Radiator Superflush, all of which could be found at the meeting, or sourced from H.M.G. Girvan, an appointed sales agent in Glasgow. Jaguar chose to promote the high speed runs and race successes that the XK120 had achieved, while on the next page, an advertisement for "The Motor World" (a sportsman's journal) and the John Brown Company (HRG and Healey distributors) feature. 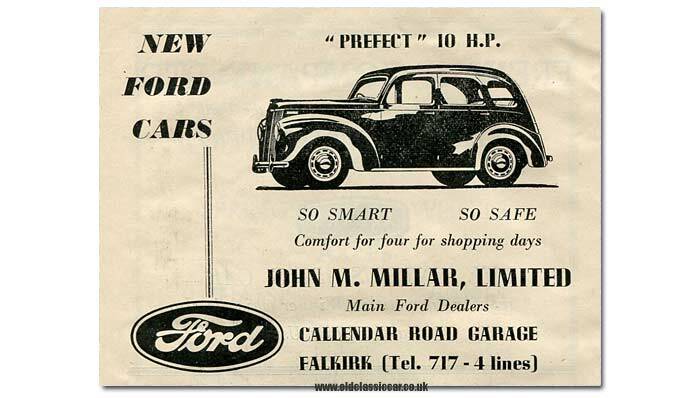 A couple of local dealers promoted the new MG TD series, and the new Ford Prefect, while the Scottish Sporting Car Club was looking to attract new members by mention of Top Gear, its club magazine (a copy of which can be read about here). In 2008 a revival meeting was held at the former hillclimb venue, and have continued to take place on an annual basis ever since. More information on the Bo'ness Hill Climb Revival can be found on the organisers' site. In 2007 a book by Kenny Baird was published that documents the hillclimb, from its pre-war beginnings through to the post-war era, with results, photographs and anecdotes sprinkled amongst its 64 pages. For anyone interested in the history of speed hillclimbing it's well worth hunting out a copy. The ISBN for the hardback version is 978 1 870519 74 8, and the paperback version 978 1 870519 73 1. Copies occasionally turn up on Amazon (see link ->), the cover of which also features Poore's Alfa. Return to the Racing Programmes collecting page.